Superior build quality. Great sound. If you own Musical Fidelity gear Get a pair of you can. They make it sing. Found these gem's as new old stock on ebay.I had just purchased a Musical Fidelity NuVista 3D CD player #281 and the listing said there was a certain synergy with these and other MF gear.I've owned about every good to great cable from as vast verity of manufactures that you can imagine.These cables bested NBS Serpents,NBS Omega 2s,Harmonic Tech magic's,Synergistic's Resoloution Ref. X2's and Mit's CVT Tube terminators to name most.Yes I gave all those cables time in my system,some a great deal of time but I kept coming back to the NuVistas more and more satisfied.Their pace,dynamics both micro and macro along with bass control were outstandingThe sound stage is wide,deep airy and precise.If i ever see more,I'm buying. Ignore the Hype these cables are not as good as the previous posters would suggest. Grabted they look the part with super thick cabling and lovely finnish. Sound wise nothing to write home about a huge big but ill defined bass coupled with a rather sat upon treble. 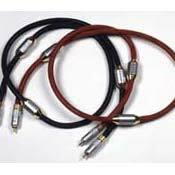 these cable have a restrained feel to their sound. I have to say I'm not surprised that MF pulled the plug on them, better to leave cabling to the big boys! excellent dynamic bass, open top end, unusual looking yet attractive. The Nu Vista interconnects are without a doubt the most accomplished cables have ever used. Use them between the pre- and the power. Lockable plugs are easy to fit and stay connected! bass, dynamics, smoothness, open sounding. bought 2.5 metre pair because felt that they would be a good match for other musical fidelity components. despite reservations about silver cables they do not sound overly sharp and certainly not forward and in fact entirely the opposite. Certainly the best interconnects have ever heard and look rather good too! I''''ve used lots of ICs - from Nordost to DIY and lots in between. I''''ve never experienced anything like the Nu-Vista ICs. These have to be one of the biggest secrets in audio. Each pair of ICs comes nicely presented in a see-thru blue lunchbox-sized case. All RCA connectors and RF clamps are tightly wrapped in a clear, protective saran-wrap like substance for protection in shipping. The IC for the positive terminal is in a red, snakeskin-like sheath while the IC for the negative terminal is dressed in blue. From a purely aesthetic standpoint, the Nu-Vistas are quite attractive - the locking RCA connectors and 3 RF clamps are robust. The cables are relatively thick and just a tad stiff, but are relatively easy to work with. Also, the cables are omni directional - there are no arrows marked to follow the flow from the source. Now, how do they sound? SIMPLY AMAZING! As soon as I let ''''em rip, I was immediately transported to the "goosebumpy" world of hi-end audio. Air around instruments, soundstaging, detail, and three-dimensionality increased dramatically. The fact that these are silver cables must have something to do with this. Detail in particular was astounding and, not to sound trite, but I DID hear things in very familiar CDs that I hadn''''t heard previously. There was a palpable "presence" of the music that really gave me the chills and goosebumps. I "felt" the music and it was great. Interestingly, the Nu-Vistas do not have the brightness characteristic typically associated with silver cables. In fact, they are very "big" sounding and are completely non-fatiguing. The POCC silver core of the Nu-Vistas has very low resistance and capacitance, and incorporates three screens. Further, they''''ve got absorbent RF clamps which are claimed not to be in the signal path. I''''m not sure how the RF clamps work, but they must be doing something right because the cables sound fabulous. This was my first foray into the world of silver ICs and I just can''''t go back to copper. The Nu-Vistas are not well-known, but they should be. Of all the cables I''''ve tried, the Nu-Vistas are the best. Period. End of story. They may be the cheapest, most substantive component you ever purchase for your rig. Oh boy did I get a bargain here. A few months ago I bought 2 x 0.7m pairs of this stuff from the place that I had bought my MF stuff from previously and yes, they did exactly what it said on the tin. Swapping them with my existing X-links bass, treble, soundstage, the lot were greatly improved. Shortly afterwards I saw someone on ebay selling a 10m pair and I think they went for about £180 - when you realise that you can cut down a 10m pair and make 10 x 1m pairs you''''''''ll see why I was kicking myself that I didn''''''''t buy ''''''''em. Anyway, I wandered back into my dealer, who so happened to have a 10m ex-dem pair from a show he had been to. £200 later, I had myself a two damn great lengths of this stuff and off I went in search of RCA plugs for the ends. Looking at the MF plugs I thought they were specially made by MF and that no-one else would make ''''''''em. How naive of me!! Profigold (whoever they are) make the exact same plugs, so several sets of those and a small amount of cutting and soldering later, I''''''''ve managed to rewire my whole system and still have 4m left over. And yeah, they sound great. If you are considering rewiring several components, my advice is to get a 10m run - even if you have to buy it new - and either cut it down yourself or get your dealer to do it. It''''''''ll save you an arm and a leg. Now I need to find 2 sets of 5m MF Nu-Vista speaker cables (ouch). Like Chao said, the bass is very impressive with these. These are the only silver interconnects that I could find that were decently priced that warranted the cost. Compared to my old Audioquest Ruby's and Topaz, these are at least 5X better! I use the interconnect for both my MD Tuner and my MF A3 CD player. WOW what a difference, with both sources. I'm going to invest in another pair so I don't have to keep switching my Tuner to the silver interconnects (currently using AQ Topaz with WBT ends). The synergy with the A3 series and this interconnect is beautiful. If you own the A3 components, do yourself a favor and get these, they are sooooo sweet and pure. Smooth and detail. Stronger bass than normal silver wire. No traces of bright and harsh sound. Reasonable price. Short in length, only 1.2M long. I have to rearrange my equipments. This cable have details and airy mood of silver wires but no brightness and harshness common to silver wires. Smoothness can par with the Audio Note silver interconnect but nu-vista have a stronger bass. Soundstage is wide and deep, but what amaze you is the tallness of the sounstage, two feet taller than AQ ruby's. The best cable I've ever auditioned in my system.